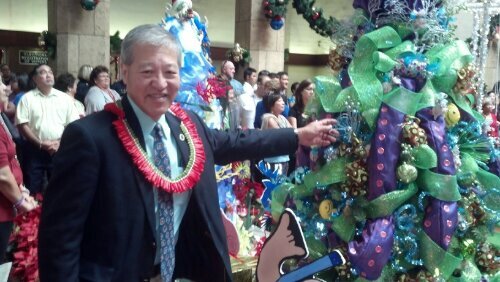 Honolulu Prosecuting Attorney Keith M. Kaneshiro in front of our department’s Christmas tree at Honolulu City Hall on Friday, November 30, 2012 at 11:30 A.M. for the opening ceremonies for the Christmas tree displays. Our tree won first place for Keiki Choice Award. This morning, wednesday, November 28, 2012 from 8:30 A.M. to 12:00 P.M., I was in Honolulu Criminal Court, Courtroom 7D tracking an Assault 3 case because the defendant in that case is a co-defendant for my Assault 3 case that has been continued. The Deputy Prosecuting Attorney calling the calendar for the courtroom and a supervising Deputy Prosecuting Attorney went to trial on a Harassment by Physical Contact case and the witness who had to take the stand had a young baby. When the baby cried, I took her out of the courtroom and rocked her until she was relaxed. Thanks to my baby niece Elyse, I got some practice for this emergency situation. The Deputy Prosecuting Attorney won her first criminal trial today! I was very proud of her! Today, Wednesday, November 27, 2012, I attended a Hawaii Prosecuting Attorney Association (HPAA) meeting at the Attorney General’s office in Honolulu, Hawaii. On the evening of Tuesday, November 26, 2012, I had dinner with friends: Jolene Lau, Representative Clift Tsuji, Representative Kyle Yamashita, Mr. & Mrs. Ho, Neal Ho, and Shin Ho at Shokudo Restaurant in Honolulu, Hawaii. Last night on Saturday, November 24, 2012, I attended the wedding for Shawn and Sheehan Ueda at Pacific Beach Hotel. Shawn is my second cousin. I was about to go to trial on an Assault 3 case today, November 21, 2012, but I got the conviction when last minute, defense pled “no contest.” The witnesses and I were pleased with the result. On the evening of Sunday, November 18, 2012, I had dinner with my mom, dad, and younger sister Lara. After, we video-called my younger sister Mia and baby Elyse who are in San Mateo, California.